This piece is reposted with permission from Costs of Care, a 501(c)(3) nonprofit based in Boston, which has as its mission expanding the national discourse on the role of doctors, nurses, and other care providers in health care spending, while empowering providers with the information they need to deflate medical bills on a grassroots level. Everywhere I look today, I see ads claiming huge savings from drug discount cards. These cards promise huge savings to consumers, yet they are unable to deliver on these outrageous statements. Now, when I see these ads, I’m skeptical – and you should be too because not all the claims are real. The old saying “If it seems too good to be true then it probably is” also applies to drug discount cards. 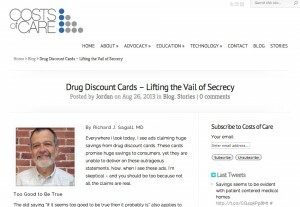 Drug discount cards have the potential of helping patients save a lot of money, but you have to understand how they work. It’s important to remember that they all work basically the same way. Here are the basics. First, a company called a “pharmacy benefits manager” (PBM) or an adjudicator sets up a network of participating pharmacies that agree to accept the cards. Then, the PBM negotiates with each pharmacy chain and all the participating local pharmacies to offer a discount on the drugs they dispense. The discount offered is usually a percentage of the cash price of the drug and the percentage may vary from drug to drug. Next, the PBM finds companies or organizations in which to market their card. These groups, called marketers, may be for-profit companies or non-profit organizations. They may be multilevel marketing organizations and some marketers work with multiple groups. The amount you pay when using a drug discount card is the sum of four components. This is true for all drug discount cards. 1. The Negotiated Discounted Price – The PBM does its best to negotiate the best discount from the pharmacies. Some PBMs do a better job of this than others. The size of the PBM, its market share, and how much business it will direct to the pharmacy are all important factors in the overall final discount. 2. Pharmacy Transaction Fee – Each time a card is used the pharmacy earns a small amount to help cover their costs. 3. PBM Transaction Fee – The amount the PBM earns to cover their costs of setting and running the pharmacy network, processing claims, etc. 4. Marketer Fee – This is how much the marketer earns for promoting and distributing the card. Who pays all these fees? You do! 1. Earning a profit even at the discounted price – They wouldn’t offer such a large discount that they lose money on the transaction. 2. Selling prescriptions they wouldn’t sell otherwise – For example, a customer may not be able to afford a prescription with a non-discounted price of $100 but may be able to afford it at the discounted price. The pharmacy gets the sale, but earns a lower profit. 3. Building customer loyalty – The drugstore business is very competitive. If a pharmacy gives you a good discount with a drug discount card you are more likely to continue to patronize that store than others. 4. Increased non-pharmaceutical purchases – There’s a reason why most pharmacies are at the back of the drugstore. This arrangement forces you to walk down aisles, increasing the chances you will make additional purchases. 5. Peer pressure – If all the pharmacies in town but one accept drug discount cards, that one will lose business. 1. Transaction Fees – Each time a marketer’s card is used the marketer earns a transaction fee designed to cover expenses and make a profit. The size of the fee varies quite a bit. Generally speaking, non-profit companies and marketers that don’t have expensive marketing programs have lower transaction fees. Lower fees mean more savings for card users. Remember, card users pay the fees. 2. Selling of Information – Some card marketers gather personal information on people who use their card. They can do this if you have to register to obtain a card. They can also receive personal information each time you use the card. For example, a company selling diabetic supplies would pay for a list of names and addresses of people who buy insulin. 1. Never pay for a card – There are many good cards that are free. There is no reason to pay for a card since it’s unlikely it would offer a discount any better than a free one. 2. Never register for a card – This is one way marketers get info that they sell. The only reason to give your name and address is if the card is being mailed to you. 4. Helpline – All reputable marketers have a toll-free helpline. Give the line a call and see how responsive they are. Do they have real people answering your questions or just a recording? If you leave a message do they call you back? 5. Shop around – Try different cards to see which offers you the best discount. Ask your pharmacist which has the best prices. 6. Consider who is making money – All things being equal, using a card offered by a non-profit is best. Any money they make is going to further their cause while the money earned by a for-profit is just going into someone’s pocket. Richard J. Sagall, MD, is the president and co-founder of NeedyMeds. He spent 25 years practicing family and occupational medicine. He now devotes his time to NeedyMeds (www.needymeds.org) and Pediatrics for Parents (www.pedsforparents.com), a children’s health newsletter.